Matthew McConaughey and Jared Leto act like they have never before in "Dallas Buyers Club"…literally. Both actors went through an extreme weight loss to play the roles of two AIDS patients desperately trying to find vaccines during the mid 80s. Based on a true story, the film focuses around Ron Woodroof (Matthew McConaughey), a hardheaded, homophobic Texan rodeo cowboy who is unexpectedly diagnosed with HIV and told he has 30 days left to live. After nearly dying from high doses of the only FDA approved drug for HIV patients called AZT, which Woodroof discovers is what the hospital treats HIV patients with, Woodroof moves to Mexico with no other medical options to search for help. Once he surpasses the 30-day mark under the care of a renegade American doctor, Woodroof partners with the doctor to smuggle in non-FDA approved medications into the states for HIV/AIDS patients. 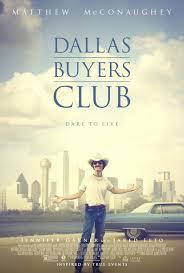 As his business in distributing illegal medications picks up with the help of Rayon, a transgender AIDS patient played by Leto, Woodroof creates the Dallas Buyers Club. The film captures the fear and uncertainty that AIDS brought during the 80s, when people were scared of shaking hands with AIDS patients and when the term “fag” was still used to describe homosexuals. The storyline may seem like a typical activist sob story on paper, but the superior level of acting and powerful chemistry between McConaughey and Leto keeps the audience engaged for the whole, two hours. Not to mention, the makeup department for this film was phenomenal with a mere $250 budget. "Dallas Buyers Club has been nominated for Best Picture, along with five other nominations. Both McConaughey and Leto have been nominated for Best Actor and Best Supporting Actor, and makeup artist Robin Matthews has also been nominated for an Oscar. "The Wolf of Wall Street" seems to be like the film’s biggest competition, but "Dallas Buyers Club still has a very good chance of winning an Oscar, if not a few, this year.